Varanasi is everything we expected India to be – an incredibly spiritual place with a lot of history and a whole host of traditions and customs on display. 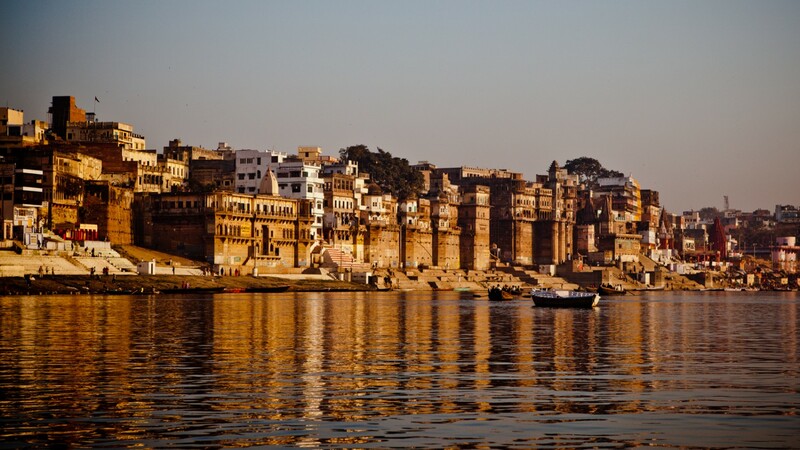 From our initial arrival at the railway station to the bustling and colourful streets to the ceremonies down at the ghats (the steps leading down to the Ganges), the city has made quite an impression on both of us. We began our morning yesterday with a trip to Sarnath, the place where Buddha preached his first sermon. We wandered around the excavations, taking in the ruined temples and large stupas (dome shaped structures marking the place of Buddha’s speech). Inside the museum were historical artefacts, including polished sandstone statues of Buddha dating back to the first century. Buddhists from around the world come to visit Sarnath, so the museum was pretty busy with people from Japan, Sri Lanka and Thailand. At dusk we headed down to Dasaswamedh, the main ghat adjoining the Ganges, to get a view of the river at sunset. We meandered through the narrow streets of the oldest part of the city which were packed full with street traders, rickshaws, people on bikes and huge crowds of people. 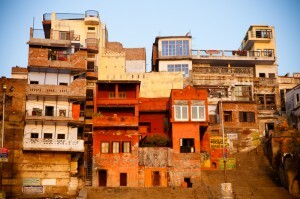 Eventually the chaos subsided and the Ganges, in all its glory, came into view. 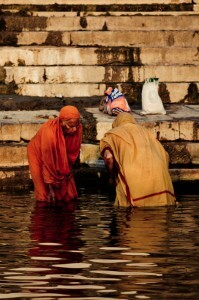 Despite the pollution below the ghat, the river really was a sight for sore eyes. We boarded a small wooden boat and took off in the direction of one of the cremation ghats, which are just a part of any river trip down the Ganges. The sight was not as visually shocking as it might sound – cremations take place in this part of the city 24 hours a day and it seems to be a part of life here. We were quite a distance away from the ghats so nothing was in full view. Afterwards we rowed back to Dasaswamedh to watch the evening ceremony and fireworks. The alarm went off at 5.30 this morning so we could make it back down to Dasaswamedh to watch the sun rise over the Ganges. This time we rowed in the other direction and took in the beautiful sunrise as it lit up the river and the colourful buildings alongside the ghats. We saw people taking part in morning bathing rituals and it was fascinating watching the city wake up from the quiet vantage point of our boat. Huge fan on this blog, a bundle of your blogposts have really helped me out. Looking towards updates!